Kids will always need creative projects to give them something to pour their creative energies into. Easy handmade gifts that kids can create to contribute to the gift giving for birthdays, holidays, or other special occasions, can help them to feel more valued as a family member. In this article, we will look at several ideas for gifts kids can create that are easy and inexpensive. Many of these projects are great for spring and summer vacations as well to help keep little ones creatively engaged. Everyone appreciates a gift when the creator has put time, energy and love into it. Mom and Dad, Grandparents, Teachers, Aunts and Uncles, siblings, and friends will all appreciate a handmade gift created by your little one. Many of the project ideas presented in this article include reusing and recycling articles that are around the home or are easily obtained from nature. I will share some project ideas, video tutorials, patterns and links that will help inspire you and your little gift maker with some fun and easy gifts that are sure to please! 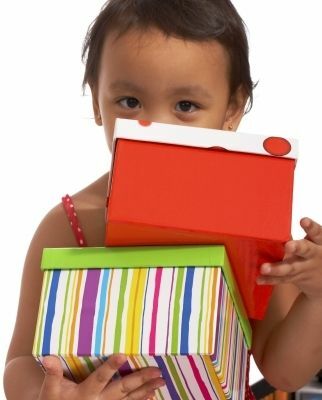 Every person in the family wants to contribute when it is gift-giving time whether they have the money for it or not. It is up to the adults and older siblings to inspire the younger family members to be resourceful. Encourage your youngster to look closely both inside and outside the home to see what items are readily available from which to make gifts. If you go for walks or visit parks, have them look high and low for items that they can incorporate into their projects. Be sure to check out the links further down in this article for more ideas! Pinecones are usually all around many homes and parks and come in different shapes and sizes. Show your little one what happens when the pinecone is wet and when it is dry. Once they have gathered them, encourage them to be with their pinecones for a while and see if they resemble animal shapes or other shapes that they can turn into cute gifts. Rocks are probably even more readily available than pinecones where you live. Look for flat rocks and rocks of all sizes. Consider rocks that they can stack and secure with glue and that they can paint on to resemble animals. They can utilize some rocks for displaying cute signs and sayings that the recipient can use as paperweights or as reminders while displaying on a tiny easel. A set of Sharpie markers would be a great idea for writing or drawing on rocks. Depending on where you live, decorating sweet gum balls was always a fun project for us as kids. 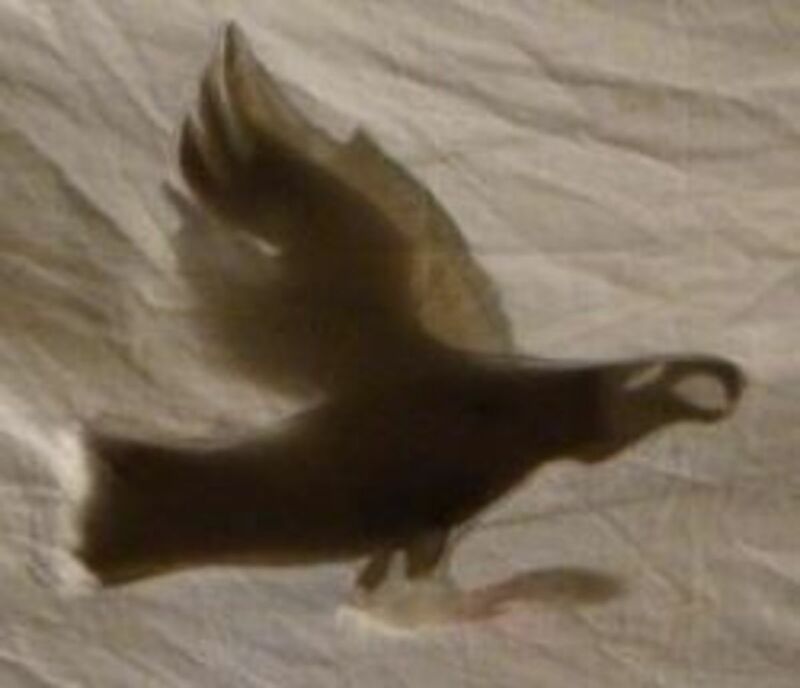 They can make cute animals out of them, turn them into special ornaments, or make them into fun mobiles. If you remember to have your little one gather some pretty leaves while they are changing colors, so much the better. You can then show them how to press the leaves between pages in a heavy phone book for a few weeks. Later they will have fun using them in decoupage projects as part of their gift making. Help your little one find sticks or driftwood that will lie relatively flat. Gather some moss that they can dry and use. Then encourage them to create tiny forest or cute animal scenes made from other nature items using the wood as a base. Using some driftwood or sticks again, they can create very pretty and interesting seascapes as gifts. Another way to use these items would be on top of or the sides of containers that they have repurposed. 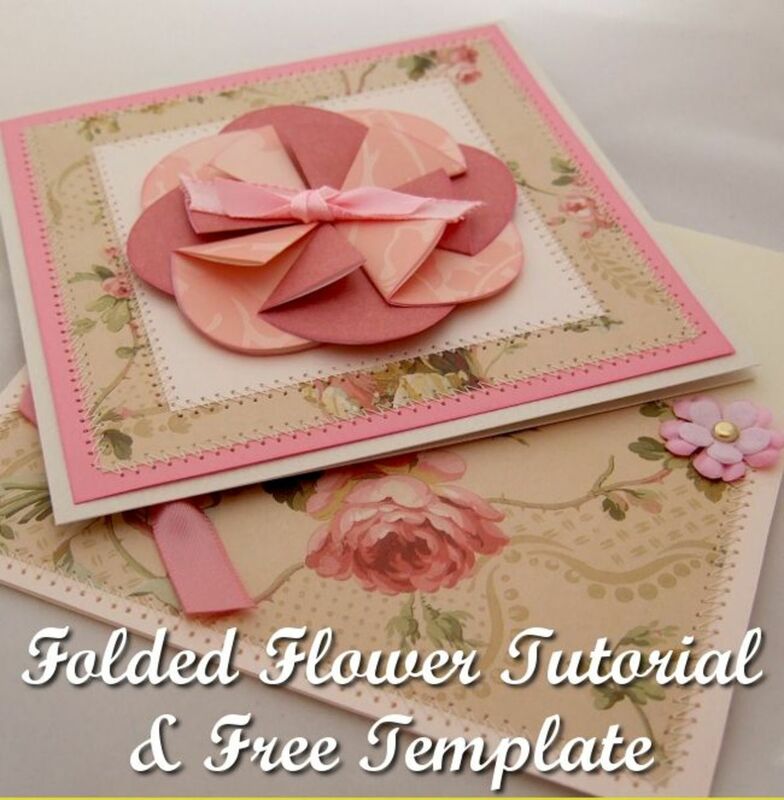 Your little gift maker can make several gifts from fabric with little effort. They can use it for decoupage projects, as backgrounds for layering other items, wrapping gifts, and much more. Another fun thing to do with fabric scraps is to tear them with the grain (preferably cotton fabric) into strips. Make long lengths or varying lengths one to two inches wide. Then give them to your youngster to braid different patterns together and make into coasters, place mats, or rugs! If you don't have scrap fabric, take a look at old worn out t shirts and see if there are any you can donate to this cause. Fleece is one of those magical fabrics that they will be able to use in a multitude of ways. It is strong and durable and doesn't fray! If you don't have any scraps of fleece for your youngster to experiment with, many shops like JoAnn stores have regular sales on their fleece. You may even find some in the mark down section of the fabric department for a fraction of the cost. The good things is that it comes on very wide bolts so a yard of fleece will contain a LOT of fabric to experiment with. Fleece is also a great fabric to cut into strips and braid for various gifts. These make wonderful chew toys for the family pooch!! Felt is another very durable material that is quite versatile. It is usually inexpensive and if your gift maker needs a lot, you can buy it on the bolt and it too comes in very wide widths. I know that JoAnn stores carry many colors on the bolt of felt and have regular sales on it as well. Felt also doesn't fray so your little one can cut out shapes for using as details on different projects. There are many different recipes that are geared specifically toward being layered in jars and given as Gifts In A Jar. They can also use jars as special containers to decorate for different family members. 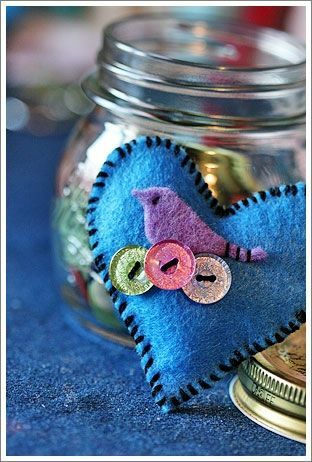 It is relatively simple to make a pretty container to hold buttons or sewing notions in the bottom of the jar and decorate the top to be a pincushion and give to the seamstress or crafter in the family. Empty containers of all types can be a great source of inspiration for your gift maker. With some inexpensive wrapping paper, craft paper, newspaper, or paints, they can turn the most mundane item into something the recipient will always treasure. Encourage the little one to think about each person and their special interests and needs. This is an easy gift for any family member or teacher as we all need containers to hold things on our desk, crafts, tools, school supplies and much more! Buttons can become easy and pretty bracelets, pendants for necklaces, or you can make them into lapel pins. Most craft stores have buttons for sale in various sizes and colors if you don't have many handy. I remember when my brother and I discovered the joys of making our own salt dough (see recipe below). With the help of an adult, the possibilities are endless! Be sure to have cookie cutters and different paints and markers with which to experiment. I'll be posting links and ideas to get you thinking with this one. You might surprise yourself at the things that you can help them repurpose into a special gift for your little one to give. Over 60 Crafts for Children to make and share! This book is divided into crafts for the different seasons and targets ages 3 to 12. Kids can explore different crafts for fun, gift giving, and for decorating their rooms. This kit will help your kids get started with their art, crafting and gift making projects! Comes complete with color pencils, oil pastels, water colors, brushes and other tools. 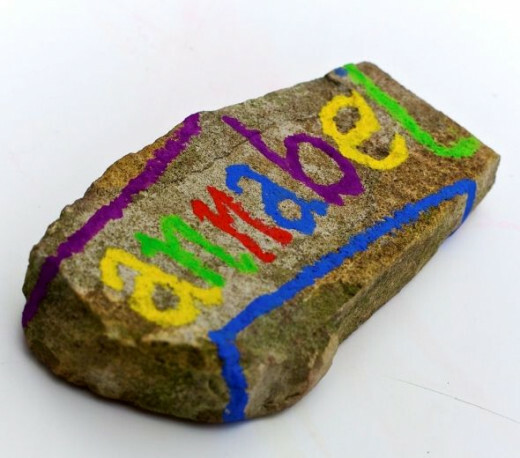 Rocks are great for kids to make gifts with as they are so plentiful and can be made into very cute and personal gifts. Make a pet rock and the possibilities are endless! Who wouldn't want their very own one-of-a-kind pet rock? They can be used for paper weights, bookends (if they are heavy enough), or to start a very fun collection for the recipient. Make an adventure out of gathering special rocks and stones by taking a trip to a nearby beach, a hike in the woods, in the backyard, or anywhere that free rocks are plentiful. Just be sure that you are allowed to take the rocks with you as some parks and other places may prohibit their removal. 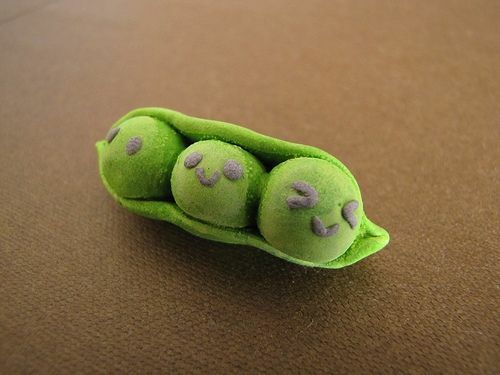 Check out this article to learn how easy it is to make Pebble Pets and let your imagination run wild! A book that teaches kids to explore the natural world and look for hidden treasure for crafts and gift making. Kids never need to want for inspiration for gifts to make and give again! For ages 9 and up, this fantastic book for kids includes 65 projects using materials found all around them. The author shares how to make paints from flowers and plants; ways to incorporate found nature objects in craft projects using shells, moss, pine cones and more; how to make tiny furniture from nature; and how to weave vines and naturally color T-shirts. 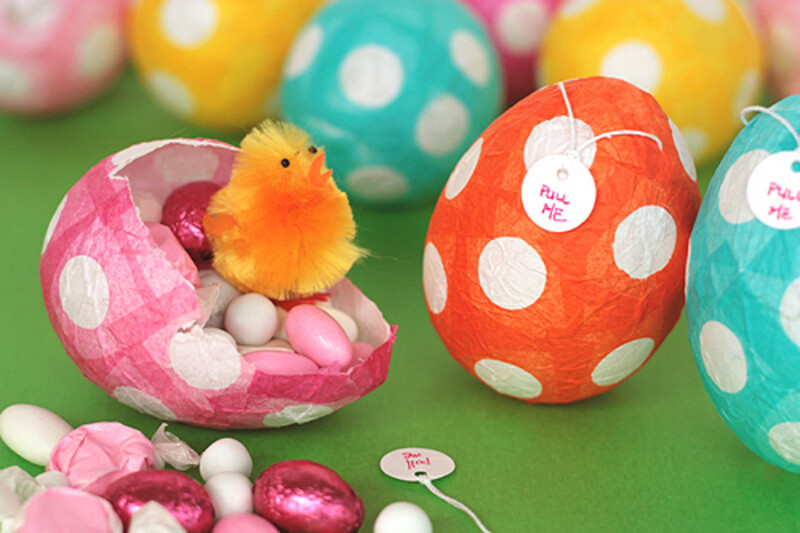 Will you be encouraging your young one to make their own gifts this year? They will make at least Some of their gifts! Pinecone Gift Project - Oh The Adorable Possibilities! Who doesn't love making gifts and crafts out of pine cones? I remember when we were kids seeing so many possibilities in each pine cone that we came across in the yard. It is so easy to make little critters, Christmas trees, memo holders and so much more. 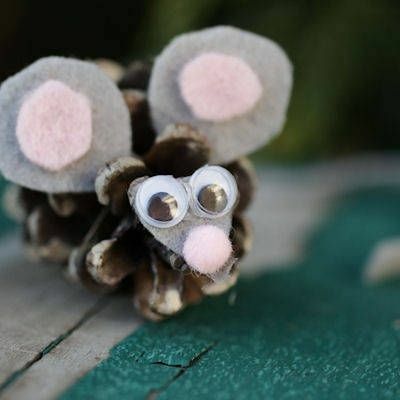 I came across a fantastic article that shares how to make the cute little pine cone mouse in the photo above! Click to read the easy to follow instructions and to get the supplies used. You probably already have the supplies on hand! Salt Dough Recipe - Kids Can Make Gifts With Salt Dough! I don't have my original Salt Dough Recipe but I found the one below and know that it is very close to the one my brother and I used many years ago. We didn't add any of the optional ingredients but they might be fun to experiment with. You can help your little gift maker with making the recipe then set them up with cookie cutters and other items to make fun magnets, ornaments, signs, animals, or whatever their imagination can come up with! Visit Original Salt Dough Recipe Article for full instructions. Feel free to paint your salt dough items and then varnish when paint is dry. I remember we used model car paint but I think you could use acrylic paints as well. Some permanent markers may work also. **Here is another link I found with a Salt Dough Recipe and talks more about the process of heating your Salt Dough items in the oven. Cute way to dress up a plain plant and give as a gift! Very cute gift ideas in this one! From hair clips to artwork made with buttons! Tons of Button Craft Links! Scroll down and look at all the cute gifts kids can make from buttons! Several links on this page for inspiration! 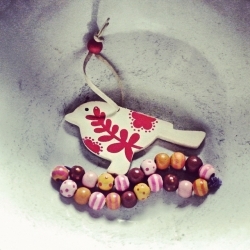 Adorable ornaments for the tree or as pendants for accessories. 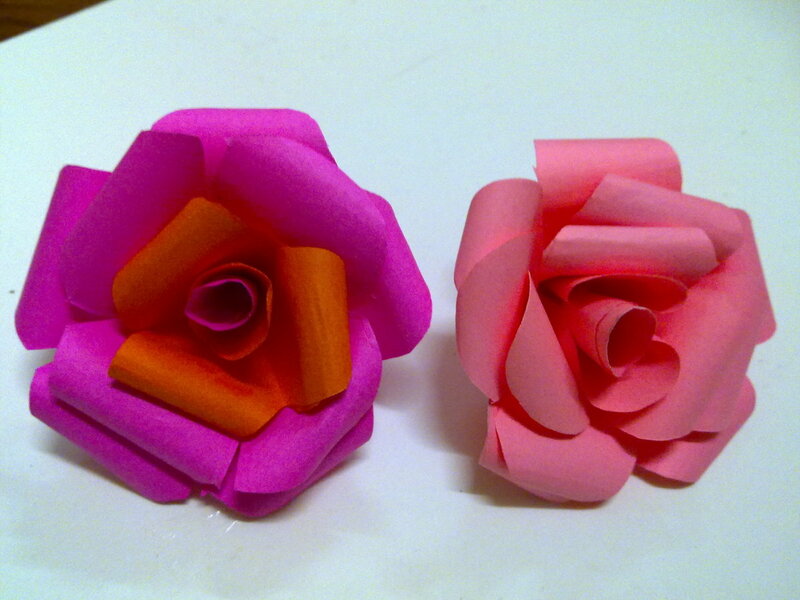 More fun links for Kids craft projects and ideas! Martha has a whole section on things kids can create from nature. From rock animals to seashell critters, there are a lot to choose from and be inspired by. These are adorable! I might have to make some myself. 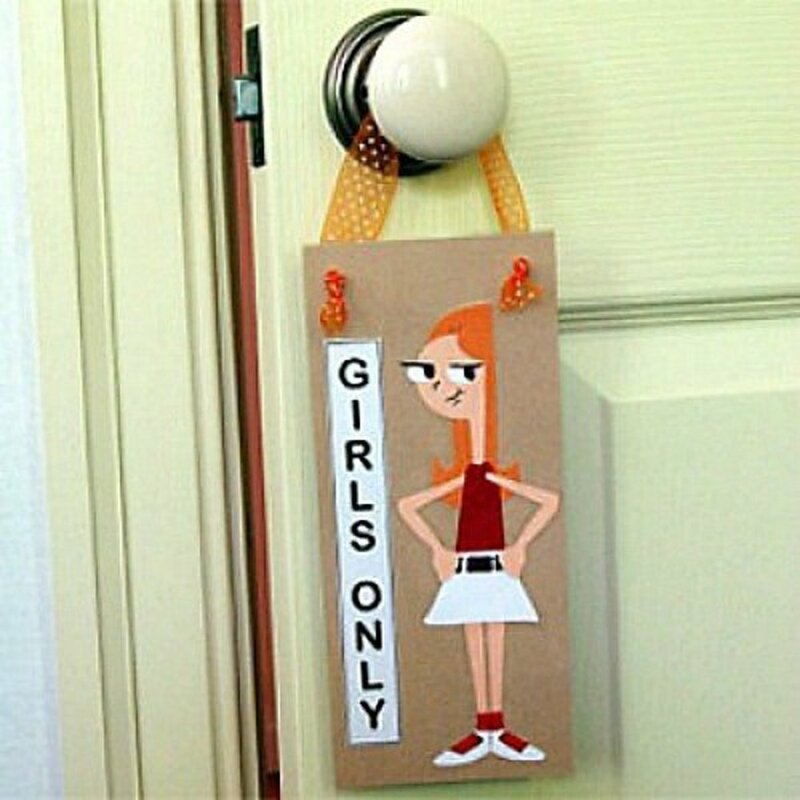 :) They would be great crafted with things to remind everyone of different family members. Kids could wrap big as well as small pieces of sea glass for lovely pendants! This link goes to a whole section of Nature Inspired crafts for kids. Several cute ideas in this link! Be Inspired By This Young Crafter! 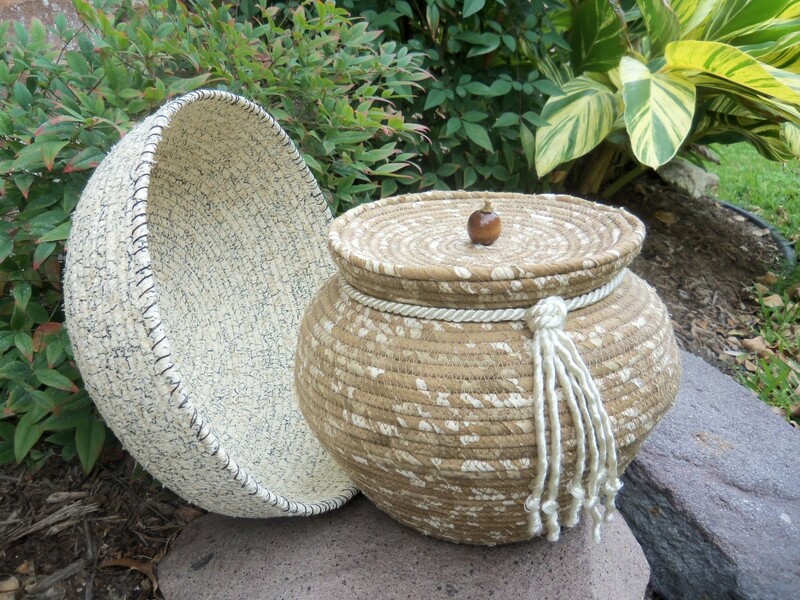 Great inspirational links for encouraging your kids to make their gifts from recyclable items!! Oh the possibilities! Tin cans, drink bottles, cardboard, and so much more! I love this idea! Another one I may have to make myself. These would look great with art drawn by your little gift maker and then insert it in the cap! You could use lots of different items with this project. Scroll down and peruse the long list on this page! Has this article inspired YOU to make some of your OWN gifts for this year? Felt is incredibly versatile and usually priced very reasonable. You can find felt in just about every color imaginable in stores like JoAnn, Michaels, Hobby Lobby and pretty much any hobby and craft store. You can also find felt by the yard in wide widths at stores that sell fabric. Some very cute gifts can be made from this site! 19 different projects that can be turned into gifts! Great gift ideas especially for siblings. Scroll down the right side of the page and see the dozens and dozens of gifts that can be made! On the Martha Stewart site there are at least 40 projects for various ages that can be made into lovely gifts. Click any video to get lots of ideas of fun gifts your kids can create for gifts all year long! Help your child paint an art painting for their gift. 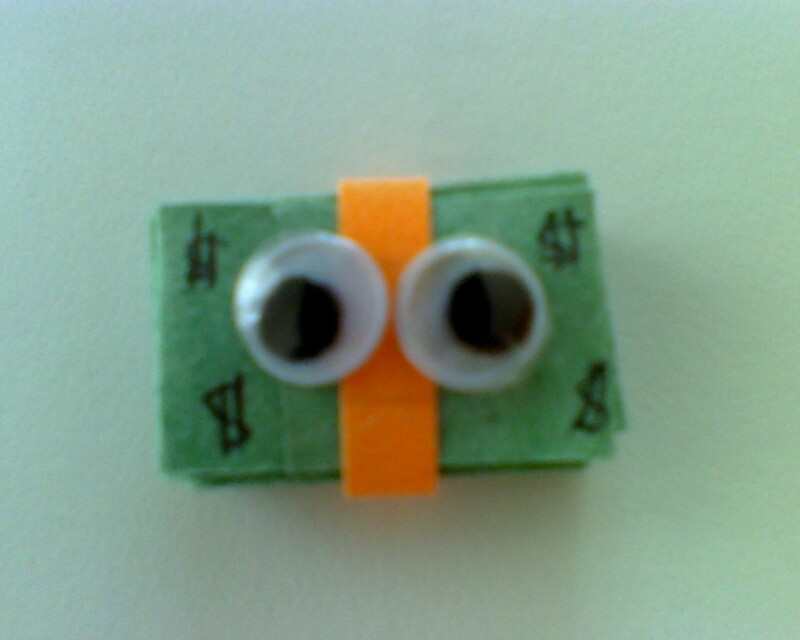 Help your little one make cute animals for gifts to siblings or other kids from recycling toilet paper rolls. For the person that loves to read. A versatile and easy craft for kids. Have fun creating art with kids. Display your kids artwork on coasters! Very cute charms for kids to make. Will You Be Helping Your Kids Make Their Own Gifts This Year? Definitely inspired to see what they can create! Great lens. My daughter LOVES to craft! What fun and great gift ideas! Love those craft ideas! Kids in summer or winter would love doing those projects! I love doing projects of any kind with my kids. And it is the perfect time of year for it. It's important they learn to give and homemade gifts can mean so much more. If I had it together I would have put together some days to have the grandkids over to make gifts! They would have loved it and I would have too. This is already a tradition in our family, in addition to do personal cards. Your ideas are great! My daughter is all grown up, but I do look forward to the grandbaby crafts ;) Happy Thanksgiving. Lovely ideas here. Blessed. I don't have kids, but I am seriously considering some rock art and pine cone creations for a few big-kid friends I know! What a GREAT lens! These look like fun craft projects for the kids! Blessings. My kids used to love craft projects and making gifts to give. Handmade gifts to me are the perfect item because it shows so much personality and the person who receives the gift will have something truly original. Nice ideas. This lens took me back to a time when I provided craft projects for my girls group at church, What fun times, full of fellowship and laughter. Priceless, as they say. I hope someone uses this article to bring some fun to a group of children. What wonderful ideas! Thanks for sharing - blessed by a SquidAngel! I believe that homemade is best. Dragging the kids around the stores doesn't make for happy holiday memories. It's lots more fun to create gifts. Great ideas! I think it is a great thing to inspire kids to get crafty. I think it is detrimental to children's creativity to have them watching tv or playing video games all the time. A nice balance is ideal. My father was more thrilled with something the kids made than anything else in the world. I love your ideas! I think homemade gifts are the best ever! There are lovely ideas here and I loved that little Pinecone mouse, and when the kids are finished with their projects, they can take price of place in their room. Oh, these are all great ideas! I added a link to this article on my Pinecone Crafts lens because of that pinecone mouse. Some of my best memories of me and my mom when i was little were making gifts for the whole family and friends! Great lens! As a child I always made gifts for family. Most were simple little projects like embroidering a hanky or something. So many fond memories. Well DONE! You've worked hard on this lens, a very thorough collection of crafts and christmas gifts kids can create. Kudos!